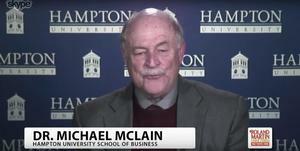 HAMPTON, VA (Jan. 3, 2019) – Hampton University School of Business Professor, Dr. Michael McLain, discussed the pros and cons of ‘Paygo’ on a daily digital news program via the Scripps Howard School of Journalism and Communications’ ReadyCam on-site studio. Without having to travel beyond Hampton’s campus, Professor McLain appeared on “#RolandMartinUnfiltered” with politico Roland Martin, this evening, to discuss ‘Paygo’ as a possible measure to control the National Debt. Located in the Scripps Howard School of Journalism and Communications, the ReadyCam studio was acquired in 2012. ReadyCam studio has broad capabilities that can transmit live or recorded HD quality broadcasts over the Internet to media organizations worldwide. The studio was created for faculty and leaders to share their expertise on broadcast news programs without having to leave campus. Dr. William R. Harvey, Hampton University President, and Bobby Scott, U.S. Congressman, have both appeared on local and national news programs via the ReadyCam as well. To book the ReadyCam studio, contact Davida Plummer at Davida.Plummer@hamptonU.edu or 757-727-5405.